CNN Football Club: Marcel Desailly answers your questions! Former France and Chelsea defender Marcel Desailly was the star guest on this week's CNN FC show. (Getty Images). Marcel Desailly was at the heart of the France team which triumphed at the 1998 World Cup and Euro 2000, as well as lifting the Champions League with both AC Milan and Marseille. 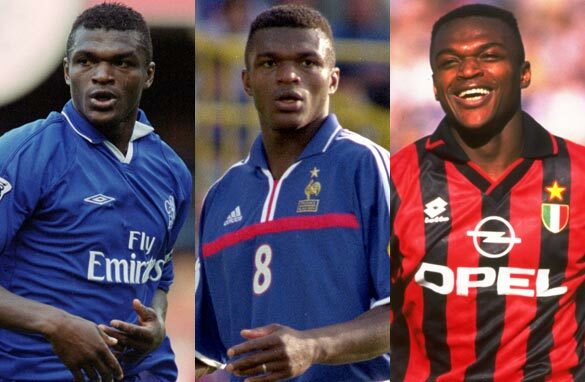 An African-born defender who went on to conquer Europe, Desailly enjoyed a glittering 20-year career which also included a spell with Chelsea before ending his playing days in Qatar. Desailly was live in the studio to talk Champions League and also to answer your questions this week as the CNN Football Club debated who is European football’s top defender. You can also vote in our poll, which this week asks the question who has been the best defender in the Champions League this season? Vote in the poll to the right and don’t forget to tune in to the CNN Football Club on CNN International at 1700 GMT on Thursdays. As an avid soccer fan i've always admired your style of play. Your enthusiam and passion for the game as well as your skill and physical ability for the game of soccer. But it hurt me to think that you never played for any of my favorite teams Manchester United and our glorious Black Stars of Ghana. Did it ever occur to you to play for Ghana ? Would you consider being a team coach in a first division European championship or even for the French NT job one day like your old buddy Deschamps ? Raphael Varane is impressive & growing up to be a top defender.How much do you rate him? Seems to be the full package of a defender like how you were in your playing days. Do you feel the current French team is capable of emulating the success of your generation? What is your opinion about the comparison by the media and several people between Cristiano Ronaldo and Messi, when they are totally different players, with different skills set and they played in different positions? And who you would like to defend: Messi or Cristiano Ronaldo. What do you think of the current Chelsea board and management? Do they know what they're doing? They certainly won the Champions League. Did they get lucky? Was racism in sport ever a problem for you or did you just rise above it? As an avid football fan who grew up watching you play, I was always enamoured by your style of defensive play and grace on the pitch. As one of the more decorated players in french football history, you came across and defended against many of the greatest offensive players of your generation. I wanted to know, when you were defending some of the great offensive players of your era, what in a more technical respect, were some of the things you would look for when they received the ball? What were your thoughts as you walked down the tunnel after being sent off in the 1998 World Cup Final? looking at the huge following madrid and united have overseas.what are your views on "does success guarantees more fans or is it vice-versa"? Just listening to Pedro Pinto's interview of Marcel Desailly and am disappointed by Perdo's reference to match fixing in Africa because according to Pedro, the players earn pittance. As Marcel told him, there is little or no fixing in Africa. CNN seems to believe that any and all bad things happen in Africa. it just so happens that match fixing is currently rampant in Europe and Asia. Africa bashing continues on CNN. What a shame. France won against Croatia despert been a man down @ d semi- final. How do u fill and thinking wen u were sent off at d final match in 1998? Marcel used to be a constructive and attacking defender. Was a fabulous reader of the game, calm and composed. With experience Vincent Kompany looks capable of scaling great heights in that position.